in a suzuki bike, bike breaks with oil! The ice at my house is 5 inches. Almost ready. 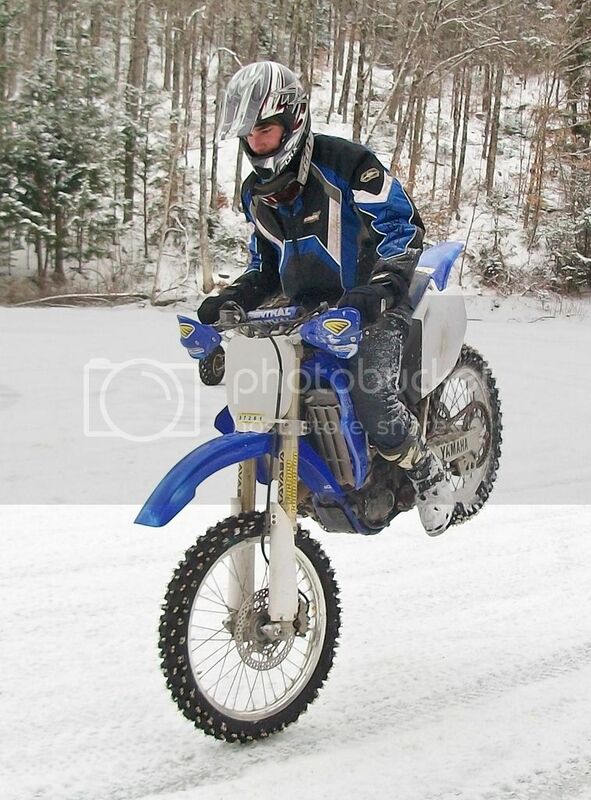 So this Saturday won't be any riding because of the snow? Just couldn't bring myself to go to work today. you running REAL ice tires or gold screws? theres a lake 5 minutes from my house that i can ride on. ive got access to a 4 wheeler with a plow. i assume that the atv will need chains or something to plow though, is that correct? You talking to ME? 1.5" rear screws and 2 liners, UHD tubes. It's a 45 pound tire/wheel assembly. You make a track, I'll have a bike you can borrow when I come ride. Honda is up and running. KTM wheels are back in my possession with fresh Fourniers mounted. I'm ready for next weekend. KTM has fresh wheels with shiny Fourniers, all wrapped and ready the ice next weekend. How many Hondas do you see? One of them is a wheel change away from being ice ready, fired it up and it runs strong after the motor transplant. Maine is not far enough to hide. I was going to make one of these posts. 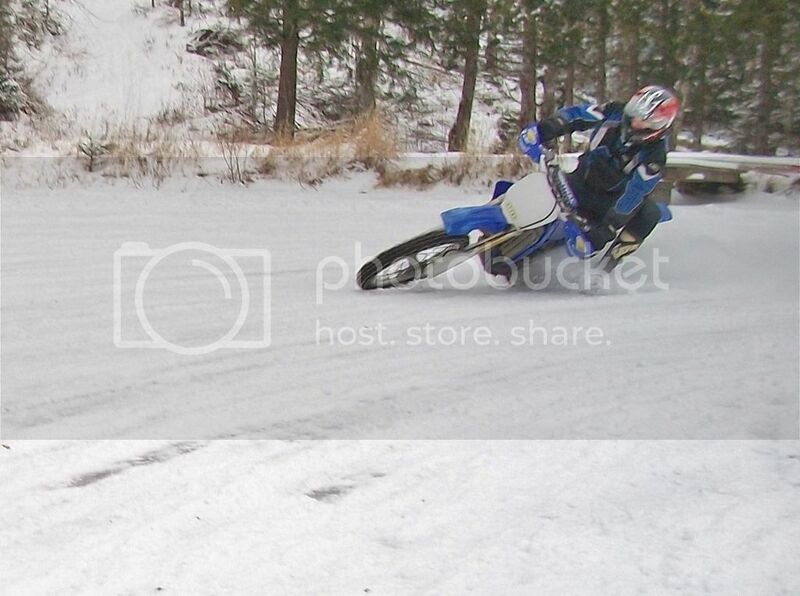 Just bought my first dirt bike in October, with the intent of doing some ice riding this winter. So far, I haven't found much for connections other than the ice racers, which is not what I'm looking for. Hoping to find something more like a small track configuration, not an oval. I live south of Boston, but willing to travel a bit, and lend a hand setting up and whatnot, if anyone is willing to provide a connection! Also, since I'm new and don't want to splurge on awesome ice tires... am I going to have a miserable time just buying 1-200 of those generic eBay screws? I'm ready to replace my dirt tires with something better, so figured I'd just stud the current ones for cheap. On a full size dirt bike, you'll rip those short screws out immediately. You really need full length screws, which requires liners inside of the tires. am I going to have a miserable time just buying 1-200 of those generic eBay screws? I'm ready to replace my dirt tires with something better, so figured I'd just stud the current ones for cheap. It will get you out there. Remains to be seen if it will get you back. You will quickly be wanting more traction. I would definitely use a hardened Kold Kutter. It's important to angle them properly and orient the screw slot perpendicular to the direction power will be applied. His sig says TTR230. Maybe 15 HP? Might work without a liner. We all gotta start somewhere. I think you want to start with healthy nubs (ie fresh tires) too. Worn nubs are not going to be long enough to support a screw, even with a liner. ive got a shitload of kold kutter gold screws that i think i may throw into the tires of my 300 and see how it goes. i dont predict i will be burning up the ice but it may help me get comfortable out there. Good attention to detail. I've seen the short(5/8-3/4") screws work in minis, so maybe they would work on a TTR? I will say, don't go for a ride on anyone else's bike with the big cheater screws...because you'll be $600 poorer shortly afterwards. if anyone needs 3/8" Kold Kutters i have about 600 you can have, just pay for USPS shipping. they're leftovers from my mini days. 2 new, sealed packs + one pack that is about half used. Mine are mounted in the proper direction. I don't want to waste my time though, so if those cheapo screws will quickly leave me wanting more, I'll do it semi-properly. Does anyone have a simple, cost-effective solution for full length screws and a liner? I've done a bit of research and watched some how-to videos, but still unfamiliar with brand names and options. Page generated in 0.19 seconds with 17 queries.